… talking, thinking, get in to a different world…A world of mottais music…Well, every one listens to music and I am no exception. I have listened to so many songs from all these music directors from different languages (predominantly Tamil, Hindi and English). But it is Ilayaraja (IR alias Mottai) who can take me to a different world through his simple music. From most of the people whom I have interacted with, they like a song because of the words in it. Because that has the maximum impact in terms of expression of emotions. Many people still appreciate IR for letting the words heard. I mean, latest music trends suppress most of the words and only the music is given much of importance. Well, that’s what most people say. Though I kinda accept that argument, I feel it is IR who gave a lot of importance to music. He had so much of music in all his songs but at the same time the words were clearly audible. But I don’t care about those words too. I don’t exactly remember all the words of my favorites songs. But I can reproduce the music part of it. That’s the impact of IR’s music, especially the violins he uses. “Rakkama Kaiyya Thattu” from “Thalapathy” is anyone’s first example when it comes to how well he has mixed the violins. In the first 30 or so seconds of the song, there would be two groups of violins playing in different pitch and they would seamlessly blend and then SPB starts it. On a similar note, one song that lingers in my mind most is “Engirundo Ilam Kuruvi” (SPB version) from the movie “Brahma”. It starts with a bass guitar and Piano, next 5 seconds is two violin track in parallel in different pitch, a flute too in parallel and the Cello(Big sized bass violin played by keeping in the floor) starts in the background…Now this pattern is repeated 3 times in different tunes to express the shock of “Kushboo” hearing her dad’s tune. This “Cello” instrument has a major impact on me. This being the bass element of the violin family creates that strong impact where words cant express the feelings. This instrument is used typically in background musics when lots of violins are playing and this is played in parallel. And IR has used it extensively. You gotta listen to the songs using headphones to really appreciate this. 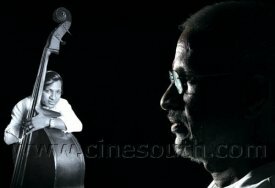 If you listen to the back ground scores, for example, Anjali BGM or Padikkadhan court scene where sivaji collapses when he realizes Rajni is his bro…a lot of such scenes have this Cello in background. And when you listen to the songs of “How to Name it” (specifically “Do Anything” song) you would definitely appreciate how good this instrument is and how well he has used it. Violins, violins, violins in all of these…”Karpoora Bommai” song from “Keladi Kanmani”, “Anjali Anjali” from the movie “Anjali”, “Kalyana Malai” from “Pudhu Pudhu Arthangal”, “Poongatru” from “Moondram Pirai”…Yeah I know, I can’t complete this list without “Kaala Kaalamai Vaazhum Kaadhalukku” from “Punnagai Mannan”… 🙂 This actually is a huge list; I have mentioned whatever struck me right away. Well, you certainly gotta carefully listen to this “Poongatru” song where he creates and approaching train’s sound using violins. Almost every song of his has lots of violins between the stanzas and they literally take you in to a different world. A world where you just float with music filled everywhere and wish you at least had once chance of being in IR’s recording studio witnessing how he composes and organizes. I once heard that this “Kanmani Anbodu” song from the film “Guna” got composed right away when Kamal was sitting in Mottai’s studio and reading out the lyrics and explaining the situation. Well, it is not that it is just violins in his music. Best example is “Mandram Vantha” song from “Mouna Ragam”…Absolutely no violin there and anyone would agree what a good song it is…And then you can talk about how well he uses chorus and the best part of silence in movies. He just leaves like 10 seconds of a emotional scene in silence and then starts his BGM and you would be moved by it. Certain things you learn from others, there would be a guru who can teach you stuff. The rest of things you learn by yourselves mostly by experimenting. But with IR I guess it is there in the genes. I think the DNA code is filled with “Sa Re Ga Ma Pa Da Ni Sa”. Science says there is so much information in the DNA, for IR I guess those are just tunes. People say that he has lots of ego and lot of directors and producers had many issues with him because of that. I guess every artist has that element of self pride on his creation. Probably it is true in IR’s case too. Or may be it is not. But it certainly doesn’t matter to me as long as he gets those violins and pianos and guitars playing. I keep wondering what would you actually feel when you are in the recording studio where, say, IR is sitting with his “Harmonium”, Vaali/Vairamuthu is penning down lyrics, Kamal/Maniratnam/Balachander narrating a situation. Previous Post What a day!!! Hey bro,I know that u r IR’s fan but i never knew that u r so crazy abt his music.I have always found u hearing ARR’s music or some english songs in our desktop. I have never seen you hear to IR’s music.I thought u to be ARR’s fan. He has got a good taste of blending music with different insturments..e.g karakattakaran.. and I love all his melodies.